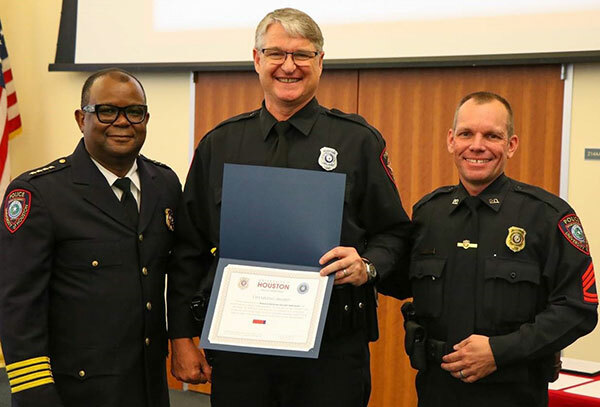 Ceaser Moore Jr., UH Systems Assistant Vice Chancellor of Police Operations, left, and Travis Gundelach, UH police sergeant, right, present a 2018 Lifesaving Award on May 7 to Stuart Sherman, University of Houston-Victoria assistant fire marshal-emergency manager and appointed police officer for the University of Houston Police Department during the UH Police Department’s Badge Pinning Ceremony at the Rockwell Pavilion in Houston. When Stuart Sherman recently was singing during a church service, he wasn’t expecting to perform CPR and save a life that day or receive an award for it. Sherman, the University of Houston-Victoria assistant fire marshal-emergency manager and appointed police officer for the University of Houston Police Department, received a 2018 Lifesaving Award on May 7 at the University of Houston Police Department’s Badge Pinning Ceremony at the Rockwell Pavilion for performing CPR April 22 on a church praise team member who collapsed during service. Sherman, who formerly was a paramedic, was able to resuscitate the woman and save her life. Travis Gundelach, a UH Police Department sergeant, works with Sherman and nominated him for the award. Sherman has worked in fire service since 1986, he was the City of Victoria’s fire marshal from 2001 to 2008 before retiring. In 2016, he rejoined the safety field in his UHV role to continue his passion to help in times of need. In addition to building policies, fire and safety inspections, and state and local compliance management, Sherman leads safety training for UHV faculty and staff to be prepared in emergencies. Sherman was glad he knew CPR and was able to react quickly, he said. If he would have waited he may not have been able to revive the woman.